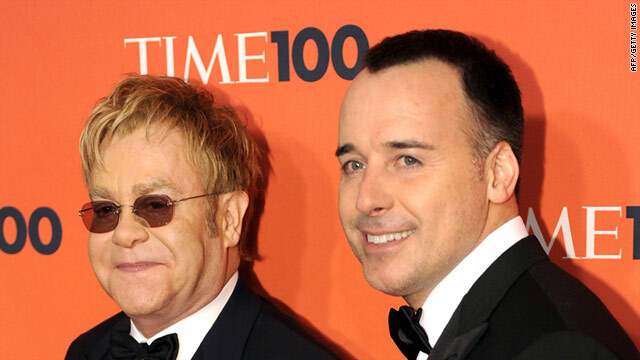 Sir Elton John and David Furnish are fathers of a baby born on Christmas Day. (CNN) -- Sir Elton John is a father. The boy was born on Christmas Day. And he shall be Levon. Or, more accurately, Zachary Jackson Levon Furnish-John, the singer's publicist said late Monday. "We are overwhelmed with happiness and joy at this very special moment," John and his long-time partner, David Furnish, said in a statement. "Zachary is healthy and doing really well, and we are very proud and happy parents." John and Furnish formalized their relationship in a much-publicized civil partnership ceremony in 2005 after 12 years together. The ceremony was held at the Windsor Guildhall -- the same venue where Britain's Prince of Wales and Camilla Parker Bowles married. John has a residence in Windsor, outside of London. The baby was born in California via a surrogate, according to Fran Curtis, a representative for the couple. Curtis said she would not discuss the details of the surrogacy arrangements. Like his namesake in John's early 1970s hit "Levon," the baby boy was born on Christmas Day and weighed 7 pounds, 15 ounces, Curtis said. In addition to "Levon," where the couple apparently snatched one of the baby's middle names, other classic John songs are likely to take on new meaning, such as "I Guess That's Why they Call It The (Baby) Blues" and "I'm Still Standing" for the toddler years. CNN's KJ Matthews contributed to this report.